Dr. Zhenglong Gu received his Bachelors of Science degree in Biochemistry and Molecular Biology from Peking University in 1998, and his PhD degree in Ecology and Evolution in 2003 from University of Chicago. 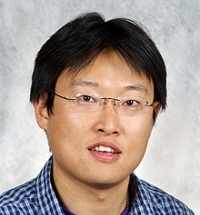 He conducted his postdoctoral research at Stanford Genome and Technology Center from 2004 to 2006. He became an Assistant Professor in the Division of Nutritional Sciences at Cornell University in 2006. Dr. Gu's is an evolutionary biologist. With training in both dry and wet labs, he started his own lab at Cornell University by investigating the evolution of aerobic fermentation in yeasts. The similarity between yeast evolution and metabolic changes in human diseases, such as cancers, called his attention to mitochondrion, the metabolic, energetic and signaling hubs of eukaryotic cells. Currently the lab is interested in understanding the role of mitochondrial DNA mutaitons and variations in human adaptation and diseases. To invent efficient tools to understand mtDNA mutation patterns. To develop mtDNA genetic manipulation tools to investigate the functional consequences of mtDNA mutations. To explore disease prevention and treatment by removing mtDNA mutations. To use mitochondria as a system to investigate environmental adaptation in model organisms and human. 2. Wang Y, Picard M, & Gu Z. Genetic Evidence for Elevated Pathogenicity of Mitochondrial DNA Heteroplasmy in Autism Spectrum Disorder. PLoS Genetics. 2016; 12(10):e1006391. PMID: 27792786 PMCID: PMC5085253. 3. Zhang R, Nakahira K, Guo X, Choi AM, & Gu Z. Very Short Mitochondrial DNA Fragments and Heteroplasmy in Human Plasma. Scientific Reports. 2016; 6:36097. PMID: 27811968 PMCID: PMC5095883. 6. Barker B, Xu L, Gu Z. Dynamic Epistasis under Varying Environmental Perturbations. PLoS One. 2015 Jan 27;10(1):e0114911. doi: 10.1371/journal.pone.0114911. eCollection 2015. 7. Lei R, Ye K, Gu Z, Sun X. Diminishing returns in next-generation sequencing (NGS) transcriptome data. Gene. 2015 Feb 15;557(1):82-7. 8. Jiang H, Xu L, Wang Z, Keene J, Gu Z. Coordinating expression of RNA binding proteins with their mRNA targets. Sci Rep. 2014 Nov 24;4:7175. 9. Ye K, Lu J, Ma F, Keinan A, Gu Z. Reply to Just et al. : Mitochondrial DNA heteroplasmy could be reliably detected with massively parallel sequencing technologies. Proc Natl Acad Sci U S A. 2014 Oct 28;111(43):E4548-50. 11. Ahmad KM, Kokošar J, Guo X, Gu Z, Ishchuk OP, Piškur J. Genome structure and dynamics of the yeast pathogen Candida glabrata. FEMS Yeast Res. 2014 Jun;14(4):529-35. Teaching: I believe the primary goal of teaching at a prestigious academic institution is to provide knowledge and instruction to students, encourage them to fulfill their potential and challenge them to perform above their own expectations. Advisory: The primary goals of an advisor are to serve as a mentor to students, and assist them in their pursuit of meaningful educational programs, which is important for fulfilling their life goals. The positive experience for students during their years at Cornell will have a great impact on their future. I have been fortunate to serve as an advisor to many students, and I have performed this role with care.